KYKNOS (Cycnus) was a king of Liguria in northern Italy who, after the death of his dear friend Phaethon, leapt into the river Eridanos and was transformed into a swan. In ancient Greek lore the swan was sacred to the god Apollon. Large flocks were believed to inhabit the river Eridanos in mythical Hyperborea where they circled the god's holy shrine singing hymns. The Hyperborean folk were themselves believed to transform into swans upon reaching old age by bathing in the bitumen swamps of the river. The normally mute swan was further believed to sing a dirge as its death approached--reputedly the sweetest of all bird-songs. "[Phaethon] upon being told by his father that his grandfather was Sol (the Sun) [Helios], put to bad use the chariot he asked for. For when he was carried too near the earth, everything burned in the fire that came near, and, struck by a thunderbolt, he fell into the river Po. This river is called Eridanus by the Greeks . . . The sister of Phaethon, too, in grieving for their brother, were changed into poplar trees . . . Moreover, Cygnus (Cycnus), King of Liguria, who was related to Phaethon, while mourning for his relative was changed into a swan; it, too, when it dies sings a mournful song." "[Phaethon was cast to his death from the chariot of the sun and his sisters transformed into poplar trees.] Cycnus, son of Sthenelus, by his maternal house akin to Phaethon, and thrice by love allied, beheld this wonderful event.--he left his kingdom of Liguria, and all its peopled cities, to lament where the sad sisters had increased the woods, beside the green banks of Eridanus. There, as he made complaint, his manly voice began to pipe a treble, shrill; and long gray plumes concealed his hair. A slender neck extended from his breast, and reddening toes were joined together by a membrane. Wings grew from his sides, and from his mouth was made a blunted beak. Now Cycnus is a swan, and yet he fears to trust the skies and Jove [Zeus], for he remembers fires, unjustly sent, and therefore shuns the heat that he abhors, and haunts the spacious lakes and pools and streams that quench the fires." "Nor thy renown may I forget, brave chief of the Ligurians, Cinyrus; nor thine, Cupavo, with few followers, thy crest the tall swan-wings, of love unblest the sign and of a father [i.e. ancestor] fair : for legends tell that Cycnus, for his Phaethon so dear lamenting loud beneath the poplar shade of the changed sisters [the Heliades], made a mournful song to soothe his grief and passion: but erewhile, in his old age, there clothed him as he sang soft snow-white plumes, and spurning earth he soared on high, and sped in music through the stars." 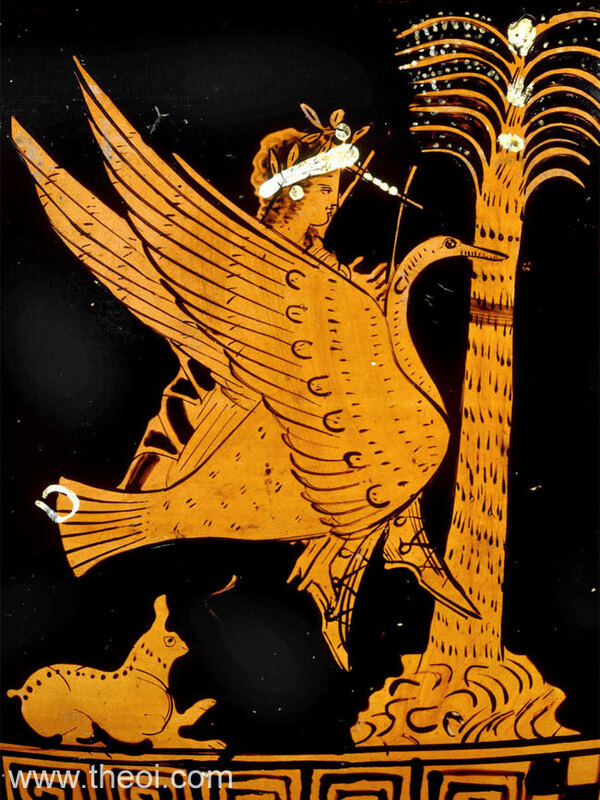 "[The birth of Apollon on Delos :] With music the swans, the gods' own minstrels, left Maionian Paktolos (Maeonian Pactolus) and circled seven times round Delos, and sang over the bed of child-birth [of Apollon], the Mousai's (Muses') birds, most musical of all birds that fly. Hence that child in after days strung the lyre with just so many strings--seven strings, since seven times the swans sang over the pangs of birth. No eight time sang they : ere that the child [Apollon] leapt forth." "The race of the Hyperboreans and the honours there paid to Apollon are sung of by poets and are celebrated by historians, among whom is Hekataios (Hecataeus), not of Miletos but of Abdera [Greek philosopher C4th B.C.] . . . This god [Apollon] has as priests the sons of Boreas (the North Wind) and Khione (Snow), three in number, brothers by birth, and six cubits in height. So when at the customary time they perform the established ritual of the aforesaid god there swoop down from what are called the Rhipaion (Rhipaean) mountains swans in clouds, past numbering, and after they have circled round the temple as though they were purifying it by their flight, they descend into the precinct of the temple, an area of immense size and of surpassing beauty. Now whenever the singers sing their hymns to the god and the harpers accompany the chorus with their harmonious music, thereupon the swans also with one accord join in the chant and never once do they sing a discordant note or out of tune, but as though they had been given the key by the conductor they chant in unison with the natives who are skilled in the sacred melodies. Then when the hymn is finished the aforesaid winged choristers, so to call them, after their customary service in honour of the god and after singing and celebrating his praises all through the day, depart." "I have mentioned the swans from the Rhipaion (Rhipaean) Mountains in the country of the Hyperboreans on account of their daily and assiduous service of [Apollon] the son of Zeus and Leto." "[On swans.] Their love song has long been notorious. But I have not heard a swan sing, nor perhaps has anyone else. There is a belief that it sings, and people say that its voice is best and most tuneful at the time when it is about to end its life." "[From a description of an ancient Greek painting of a marsh :] No wonder that the swans are ridden by Erotes (Loves); for these gods are mischievous and prone to sport with birds, so let us not pass by without noticing either their riding or the waters in which this scene lies. Here indeed is the most beautiful water of the marsh, issuing direct from a spring, and it forms a swimming-pool of exceeding beauty. In the midst of the pool amaranth flowers are nodding this way and that, sweet clusters that pelt the water with their blossoms. It is among these clusters that the Erotes are riding sacred birds with golden bridles, one giving free rein, another drawing in, another turning, another driving around the goal-post. Just imagine that you hear them urging on their swans, and threatening and jeering at one another--for this is all to be seen in their faces. One is trying to give his neighbour a fall, another has done it, still another is glad enough to have fallen from his bird that he may take a bath in the race-course. On the banks round about stand more musical swans, singing the Orthian strain [i.e. a high-pitched melody], I think, as befits the contestants. The winged youth you see is an indication that a song is being sung, for he is the wind Zephyros (the West Wind) and he gives the swans the keynote of their song. He is painted as a tender and graceful boy in token of the nature of the south-west wind, and the wings of the swans are unfolded that the breezes may strike them." "In his passion for driving this son [Phaethon] of Helios (the Sun) ventured to mount his father's chariot, but because he did not keep a firm rein he came to grief and fell into the Eridanos (Eridanus) . . . Now the youth is thrown from the chariot and is falling headlong--for his hair is on fire and his breast smouldering with the heat; his fall will end in the river Eridanos and will furnish this stream with a mythical tale. For swans scattered about, breathing sweet notes, will hymn the youth; and flocks of swans rising aloft will sing the story to Kaÿstros (Cayster) and Istros (Ister) [rivers of Lykia and Skythia]; nor will any place fail to hear the strange story. And they will have Zephyros (the West Wind), nimble god of wayside shrines, to accompany their song, for it is said that Zephyros has made a compact with the swans to join them in the music of the dirge. This agreement is even now being carried out, for look! The wind is playing on the swans as on musical instruments." "Or if some black bitumen catches fire or yellow sulphur burns with little smoke, then surely, when the ground no longer gives such food and oily nutriment for flames . . . 'Tis said that Hyperboreans of Pallene can cover all their bodies with light plumes by plunging nine times in Minerva's [Athena's] marsh [i.e. a lake of bitumen]. But I cannot believe another tale : that Scythian women get a like result by having poison sprinkled on their limbs." "Thus, at the summons of fate, casting himself down amid the watery grasses by the shallows of Maeander (Meander), sings the white swan." Greek Papyri III Anonymous, Fragments - Greek Poetry C4th A.D.
Seneca, Agamemnon - Latin Tragedy C1st A.D.